EN · nursery web spiders DE · Raubspinnen PL · darownikowate RU · пауки-пизауриды, пауки-бродяги from Wikipedia: Nursery web spiders are spiders of the family Pisauridae. 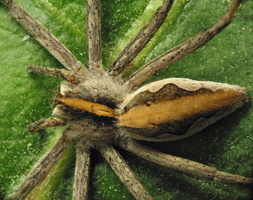 They resemble wolf spiders (family Lycosidae), but they carry their egg sacs by means of their jaws and pedipalps (instead of attaching them to their spinnerets). When the eggs are about to hatch, a mother spider will build a nursery "tent," put her egg sac inside, and mount guard outside. 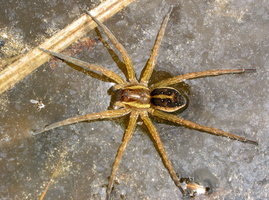 The name nursery web spider is especially given to the European species Pisaura mirabilis, but the family also includes fishing spiders and raft spiders.